Whether it’s a third grade spelling bee or the Superbowl, putting yourself into competition takes a ton of courage. 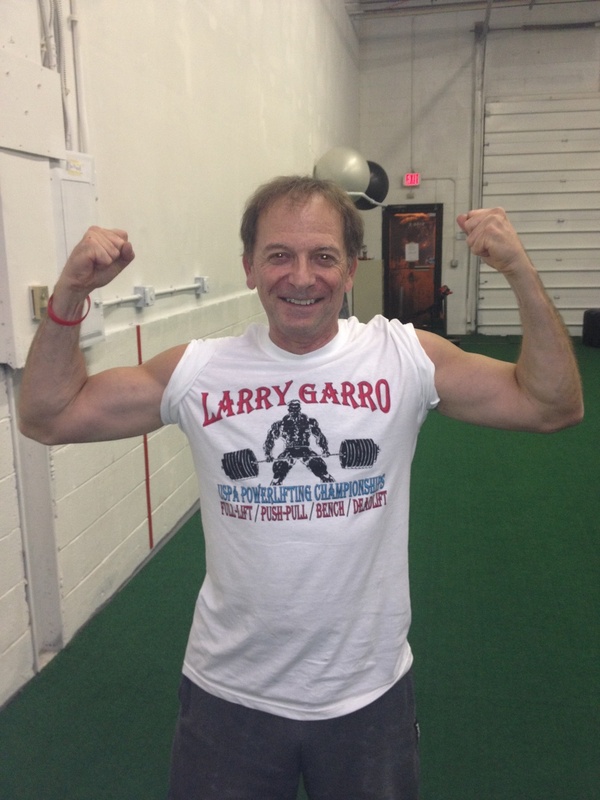 At 64 years young, Conrad of SAPT fame decided that it was time to enter into his first powerlifting meet (why not?). Even a double knee replacement wouldn’t keep Conrad from competing, and he decided to enter into the bench-only meet. Conrad was competing in the 164.9 weight class. He was concerned prior to the meet that he might not make weight, but ended up stepping on the scale at a whopping 159 pounds. He came prepared, however, with plenty of fluids and snacks to get properly hydrated before he stepped on the platform. The typical sequence of a powerlifting meet is 1)Squat, 2)Bench Press, and 3)Deadlift. The lifters will have 3 attempts at each lift, and with two flights of competitors in the squat, we had plenty of time to relax and watch the squat attempts. We saw lifters of all shapes and sizes squat one after another. It was awesome to see all the different leverages people possess and the different styles of squatting they chose to utilize. High bar, low bar, Olympic shoes, Chuck Taylors, wider stance, narrow stance, long femurs, long torsos- basically every variation of a barbell back squat that you could imagine. Anyone interested in biomechanics should definitely check out a powerlifting meet just to see the infinite variations in the same basic movement pattern. Towards the end of the second flight of squat attempts we decided it was time to start prepping both body and mind to push some heavy weight. Taking the “if it ain’t broke don’t fix it,” attitude Conrad went through the same general warm-up as he does prior to a session at SAPT. Mobility work, scap pushups, face pulls and external rotations were all part of the ritual. Just as important as getting physically warmed up for the bench attempts is getting mentally focused. At this point, Conrad’s level of raw strength was out of our control. The strength-building portion came from weeks of hard work on a brilliant bench specialization program designed in the top secret laboratory that is Steve Reed’s mind. However, this was the time where it was critical to take charge over the factors that we can control, of them being 1)Techniqu0e, and 2)Obeying the commands. The head judge gives three commands after unracking the bar (start, press, rack) during each attempt, and failure to obey any of these commands results in a “no good” lift. Following the general warm-up we got on the bench. We started with light triples and progressed into heavier singles, ensuring that each rep was crisp and clean. The bar touched the same spot on his chest with every press, the elbows were nicely tucked at the bottom, and each command was obeyed as I yelled them out during the warm-up. Having successfully primed his central nervous system to its fullest capacity, Conrad was warmed up, suited up, and ready to go. He was in the first flight of benchers and stepped on deck for his first attempt in a powerlifting competition. Conrad opened at 85kg (187lbs). It was a solid opener, and flew up at lightning speed. Undisputed three whites from the judges for a good lift. His second attempt was 92.5kg (203.5lbs). Another easy bench for Conrad and three whites. Third attempt here was 97.5kg(214.5lbs) for a PR. Again another solid, clean lift that received a well deserved three whites from the judges. To sum it up, Conrad walked away from the meet three for three on his attempts, a PR, no torn pecs, and shoulders still in-tact! Can’t ask for much better than that. Congrats Conrad, way to represent SAPT! Big thanks to Ron, Jen, and Sondra being part of the SAPT support staff, and a double thanks to Ron for taking videos of the attempts!